In November 2004, Frank Warren handed out 3,000 postcards to strangers. He invited people to write down a secret anonymously and mail it to him. Each secret had to be true and something that had never been shared with another person. These initial secrets were exhibited in Washington, D.C., later that year. After the first exhibition closed, word of the project spread. People began creating their own homemade postcards and the artful secrets started arriving from every continent. Today, Warren has received more than 450,000 postcards and they continue to come at a rate of about 1,000 per week. 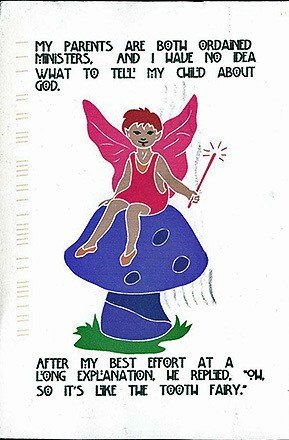 Every Sunday, Warren posts secrets on his award-winning website, www.PostSecret.com. This international phenomenon has spawned five New York Times bestselling books, a successful traveling exhibition and a public speaking tour. To coincide with the release of Warren’s fifth book by the same title, PostSecret: Confessions on Life, Death and God brings together secrets exclusively on the subject of faith. Why is PostSecret so appealing? It is because Warren has tapped into the universal stuff of being human, the collective, often unconscious level of existence that defies age, culture, gender, economics, and so on. Addictively compelling, the cards reveal our deepest fears, desires, regrets, and obsessions. PostSecret: Confessions on Life, Death and God brilliantly illustrates that human emotion can be unique and universal at the same time. The secrets are both provocative and profound, and the cards themselves are works of art. Carefully and creatively constructed by hand, the postcards are made from cardboard, old photographs, wedding invitations, and other personal items artfully assembled and have traveled to Warren from all over the world. Frank Warren was born in Arizona and went to high school in Illinois. He later graduated from UC Berkeley with a degree in Social Sciences and moved to the Washington, D.C. area to start a business. Fifteen years later, Instant Information Systems, his small business, takes up less of his time as he devotes more time and energy on the project that thrust him into the public eye. He continues to call himself an “accidental artist” because he does not have any artistic background or training. Warren lives in Germantown, Maryland with his wife and daughter. in cooperation with Frank Warren. Will you confess your secret? In conjunction with our exhibition PostSecret: Confessions on Life, Death and God, you are invited to anonymously contribute a secret to our own Wildcat Confessions wall. Submit your postcard between October 4 and December 12th.